The News from Arkansas is a poignant and entertaining memoir that celebrates life in whatever form it takes. Valerie Katz found herself in a whole new world when she and her husband David moved from California to Arkansas. There was a lot to learn and much to laugh about as Valerie practiced her Southern drawl and worried over what traditional Southern hospitality—much of it centered around gifts of food—was doing to her waistline. 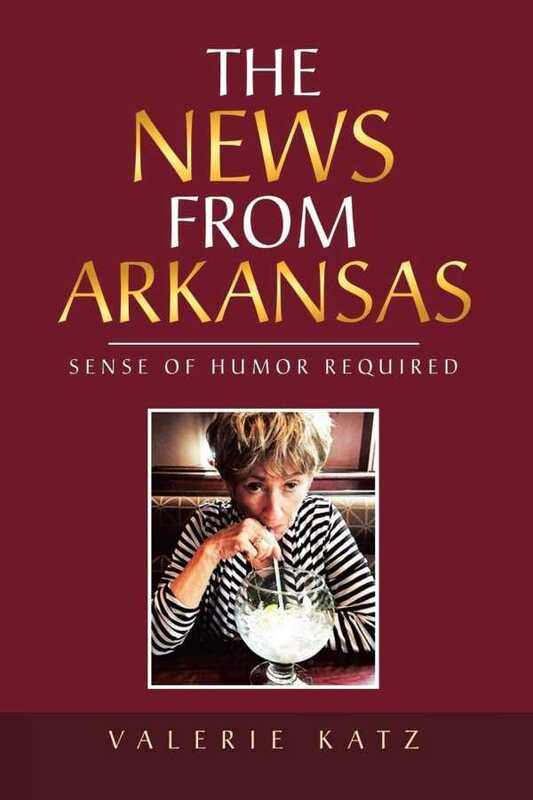 Made up of email updates she sent to family and friends back in California, The News from Arkansas: Sense of Humor Required is a funny, vibrant, and sometimes disturbing memoir about the real meaning of home. “Arkansas was almost a foreign country to us,” writes Katz, who found herself overwhelmed with setting up her new house, learning new customs, and discovering the intricacies of a recycling system that called for sorting everything “ten ways to Sunday.” While she laments being so far away from her close-knit family and missing her mother’s ninetieth birthday party, she treats everything as a new adventure—even ice storms, chiggers, and the constant stream of invitations she receives, including those that involve accompanying her new friends to their church. When David’s visit to an area VA hospital resulted in a diagnosis of cancer, the Bible study group she joined became her life raft in a stormy sea. Katz’s descriptions are lively and colorful, and her book is filled with appreciation for the simple things of life, including good friends, good food, good wine, and the health benefits of margaritas. It’s a testimony to the power of joy and humor to smooth out rough spots and help deal with the changes and challenges associated with aging. Katz reveals the joys and benefits of maintaining and nurturing ties with distant family and friends, even when it’s difficult, and her narrative provides many examples of how making the effort enriches her life. The book is friendly and conversational in tone, and the manner in which it handles difficult or intimate topics is an example of love in action, conveying disturbing news with honesty and sensitivity, and sharing mistakes and new adventures with verve and, at times, all-out hilarity. From stories of medical emergencies and dealing with technology and motor home repairs to finding new love after loss, Valerie Katz’s The News from Arkansas is a poignant and entertaining memoir that celebrates life in whatever form it takes.